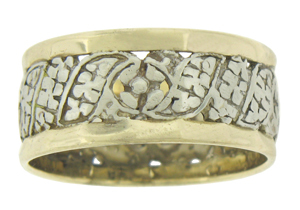 Spinning leaves and abstract blooms adorn the center of this stunning vintage wedding band. The deeply engraved white gold center band is lovingly caressed between softly faceted yellow gold bands. 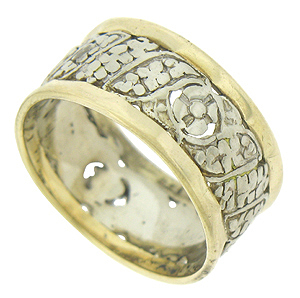 Crafted of 14K yellow and white gold, the wedding ring measures 8.41 mm in width. Circa: 1940. Size 5 1/2. We cannot re-size.